Journalists and intelligence officers share much in common: both seek to uncover truth by collecting, analyzing, and disseminating information. Both also go to great lengths to protect their sources. Yet, there is an inherent tension in the relationship between the press and intelligence resulting from the need for the activities of the US Intelligence Community to be kept secret and the media’s job in sharing information with the public. 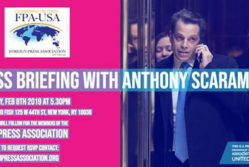 The transformation of news into a 24/7 business has complicated further the relationship between media and intelligence. The press holds a critical yet informal role in overseeing intelligence by holding agencies accountable to the public. Still, challenges remain in reporting responsibly on intelligence-related issues. What risks do members of the press take into account when disclosing intelligence-related information? Does the press play any role in the politicization of intelligence? Under what circumstances can the press and intelligence agencies cooperate and engage in mutually beneficial discussions? 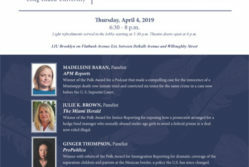 Please join the Schar School of Policy and Government and the Michael V. Hayden Center on Tuesday, April 16th, for a panel discussion on the relationship between US intelligence and the press. 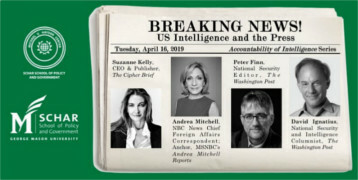 Part of the Hayden Center’s Accountability of Intelligence Series, this discussion will feature prominent print, TV, and “new media” journalists, editors, and publishers with decades of experience in reporting on intelligence-related issues. Panelists will deliberate the responsibilities of media in ensuring that the activities of the intelligence community are compatible with the public’s expectations for openness, transparency, and adherence to democratic values. Andrea Mitchell, NBC News Chief Foreign Affairs Correspondent; Anchor, MSNBC’s Andrea Mitchell Reports. Given that this will be a high-demand event, if you can’t attend, it’s easy to cancel your registration from your Eventbrite account. Just log in to Eventbrite, go to the Tickets page, and locate your order. Click your order to view order details, and then select “Cancel Order” to cancel your registration. How can I learn more about GMU’s Schar School and the Hayden Center?